Colby Cabot and her brother Hunter grew up with the Morgan brothers, Alec and Joe, as friends and neighbors in Lake Sandy, Oregon. When Colby married Mark Baxter, she was pleased that Mark and Joe quickly became friends as well. But when a foolish dare by Mark leads Joe to jump off a cliff above Punch Bowl Falls with tragic consequences, the Morgans blame Mark for Joe’s death. A short time later, a guilt-plagued Mark, who rejects treatment for his bipolarism, jumps to his death from the ninth-floor balcony of the couple’s apartment. Colby, who witnessed her husband’s death, suffers from PTSD as well as grief and guilt over the failure of her five-year marriage. Two years later, Colby has moved through the worst of her grief, but she has been changed by the experience. She has abandoned her career in law and is set to open A CertainTea, her dream restaurant that will offer casual elegance and a place for families to relax or celebrate. The restaurant is funded by her father’s tea company. When the chef Colby hired backs off at the last minute, her brother, representing the Cabot Tea Company, hires Alec Morgan as the chef’s replacement. Colby is not pleased. She fears that her friendship with Alec has been irreparably damaged by Joe’s death and that his presence will bring back all that she is trying to leave behind. Alec is having his own struggles, both personal and professional. He is consumed by guilt over the role he believes he played in his brother’s death and in Mark’s death. His relationship with his father had always been a fraught one. His father, a macho cop, views Alec’s career choice as unfit for a real man, and Alec’s success failed to change his view. Since Joe’s death, the connection between Alec and his father has deteriorated even further. Alec’s problems affected his job performance, and the year after his brother’s death, his celebrated restaurant closed. His reputation as an award-winning chef took a big hit. Alec sees his position at A CertainTea as a chance to redeem his reputation, and he is determined to succeed, for his own satisfaction and to prove his father wrong. Alec has long had feelings for Colby, but he keeps them buried. He is convinced that she would never be able to forgive him if she knew the secret he has harbored for two years. Colby misses Alec’s friendship, but she is convinced that he shares his father’s views and holds her guilty by association for Joe’s death. Working together forces them into each other’s company, but their relationship is further complicated by their different visions for A CertainTea. Can these two move past their disagreements, guilt, secrets, and family tangles to reach the HEA they deserve? 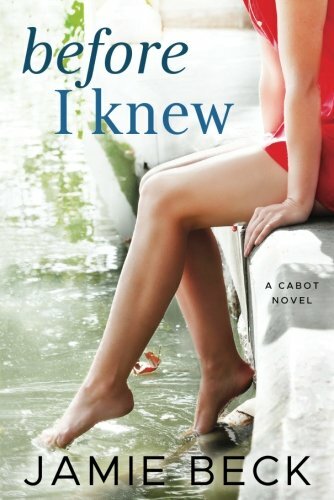 Before I Knew is the first book in the Cabot series. It is also the first book I have read by Jamie Beck. It will not be the last. Beck’s complex characters and perfectly paced, layered plot made this an excellent read. Colby and Alec are likeable characters, credibly flawed and dealing with wounds inflicted by people they love. These are characters in whom I believe and for whom I root without reservation. Their story is one of the best contemporary friends-to-lovers stories I’ve read. Beck deftly weaves together the romance thread and the family complications, giving her readers a seamless and engaging story. This one will evoke sighs and perhaps some tears. I definitely recommend it. Readers see just enough of Colby’s brother Hunter and their younger half-sister, Gentry, to be primed for more books in this series. I’m already looking forward to All We Knew, available January 30, 2018. It is a marriage-in-trouble story, one of my favorite tropes. Adding this to my TBR....thanks! I was just checking this out on Amazon the other day, Janga. It sounded interesting but I'm always fearful of buying a new-to-me author without getting some feedback first. Thanks for the rec! Great review. Just added this to my wish list. A new author is always a find. I hope all of you will try Beck's book and enjoy it. I started reading her St. James series after I wrote the review and so far so good. I consider this author a great new find. Her website labels her books "smart fiction with heart." Based on Before I Knew particularly, that sounds accurate to me. Thank you for the review. This sounds like a good, complex story. I look forward to trying this author and reading this story.